I have just returned from another trip to Cyprus spreading the word and distributing copies of Androula’s Kitchen to some new outlets. It’s now on sale at a traditional bakery and cafe based in an old watermill near Polis, an arts and crafts centre called Exhibit @Polis in the centre of town and in a centre called ‘The Place’ in old Paphos where it will sit very comfortably among the arts and crafts on display. This centre was opened last year in an old converted warehouse, it now houses many examples of traditional wares and demonstrations with some of the artisans working on site on certain days. There is a display of the shadow puppets with a small theatre for occasional performances as well as a weaver, a potter and various other activities on display along with goods for sale like glass art, pottery, wine and some foodstuffs. Altogether a very attractive place to visit.It is right in the heart of the old town which when I visited was in the grip of an upgrade in true Cypriot style. The roads and pavements torn up and no clear signs as to how you can access the shops just a sign to say ROAD CLOSED which was pretty obvious. I fear the shops will have lost a great deal of business from the passing tourists.When it is finished the area will be pedestrianised and should be a pleasing place to stroll around. Next year, 2017 Paphos will be the city of culture so it is all systems go to get it ship shape. When it was first announced there was quite a bit of astonishment as the poor old town had seen a severe decline over recent years. Many of the traditional eateries have disappeared and shops lay empty and dusty while along the main road near the market many tourist cafes have sprung up. Paphos has two Malls on the outskirts which have played their part in taking businesses out of the old town, these mainly house the chains and clothes stores. The town gave an appearance of a shambles approaching from certain directions, with a jungle of hoardings and signs and odd extensions attached to some buildings but with a fresh approach the Mayor has been getting illegal hoardings and extensions removed with most of the businesses co-operating. This should make the whole town look neater and more coherent. I had often wondered at Cypriot planning regulations regarding buildings and indeed if there was any city & town planning, as there are so many ugly buildings erected that do nothing to blend in with original existing buildings or add anything to the area. When I heard of the work to upgrade Paphos my immediate thoughts were that the municipality would be knocking down any old buildings and making everything the same as everywhere else i.e knocking any character out of the place. But after hearing a friend tell me that she was allowed to view an area under restoration, we were quietly hopeful that this may turn out well.This area was being reconstructed using old plans of how it was, creating a small friendly place including a bakery and cafe and an open air theatre. There are some parts of Paphos that have attractive old buildings and I have noticed one or two have been renovated , if this was made a policy so as to give cohesiveness as they have done in Nicosia on the Green line , it would make a huge difference. In Nicosia many of the owners of old and in some cases derelict properties,were given an incentive to renovate which has resulted in a transformation of what was only a few years ago a run down area.This has encouraged young designers and artisan back into the newly renovated spaces, giving a good lively buzz. I was impressed by the refurbishment of the old power station in the back streets of Paphos which now houses the Cultural Centre which bodes well. One of the saddest things that has happened with Paphos becoming such a tourist area, extending to Polis and beyond is that where the cafes and restaurants catered for the Cypriot local workers and families who love to eat out, they have now just set their sights on the tourist. Just a few years ago I remember having a great choice of eateries in the Polis area that did good local food at very good prices, sadly these have one by one disappeared. In the back streets of Paphos there is an area of workshops whose occupants, in some cases have been working there for many years,some their whole working lives, I hope these have also been given consideration in the up grade and not forced to vacate the area, taking with them the working heart of Paphos. This is a common problem not just in Cyprus, often the areas that house workshops and artists’ studios are by their nature in the cheaper end of town in old buildings, if the area gets “smartened up” it usually means the rents go up and out go the occupants.It also means much of the character goes with them. I feel there is a gap in the market for some local producers to step in, I don’t mean traditional either, I mean artisan. A good delicatessen type shop would be great selling all the best of local Cyprus produce , great olives and olive oil:an artisan bakery selling some organic breads using the old strain of wheat. I miss the bread of Cyprus that used to taste so good like many of their foods. An artisan cheese maker producing not just halloumi, anari and feta but some soft goats cheese, a hard sheep’s cheese or maybe even a blue cheese. In other European countries there are so many varieties of cheese produced. I love kefalotiri which is produced in Greece, but there is no reason why it could not be also produced in Cyprus. The major cheese producers in Cyprus seem to be focused on exporting huge quantities of halloumi across the globe but in Cyprus there could be outlets for the small individual and specialist dairies.There is a growing interest in authenticity and quality, there is a definite place for it in Cyprus and more farmers should look towards growing organic which is not only where good health lies but profitability. Slowly I have seen more interest grow in this area in Cyprus and there have been several regular Farmer’s markets popping up over the island where small organic producers can sell there produce. Another need is for some organic chicken producers as much of the chicken sold has no flavour and no provenance, not long ago pork and chicken in Cyprus had a superb flavour, how are the farmers rearing their animals now? There is a wealth of old recipes that are mostly forgotten that in some small quarters are being revived by young enthusiastic chefs, I am looking forward to a renaissance in local cooking and the rejection of those ubiquitous oven chips that are creeping in. Vive la chip!!! I’m on my travels and Monday I paid a visit to Larnaca. One of the many places I had wanted to see was the Hala Sultan Tekke a famous and important pilgrimage sight for Muslims. It is said that it was built over the tomb of Mohammed’s foster mother. I had seen it many times from afar across the salt lakes coming from the airport, it is one of the iconic scenes of Cyprus. On Monday I got up close and personal. The surrounding area looks very lush with Palm trees and greenery and looks very much like an oasis set as it is in the flat landscape with salt lakes around. There isn’t much to see inside as with most mosques it is very plain with no decorative adornment, there were however a few bids flying around the ceiling, swallows and pigeons and an immaculate fitted carpet throughout.The scenery around the mosque is unique and spectacular set as it is amongst water with the crusty salt deposits gathering on the shores where the water laps into the grasses. From there I continued on into Larnaca town where I was to meet up with my sister-in-law for lunch, as she had just popped over from the UK for a brief visit. After a leisurely and delicious lunch at Militzis looking out to the sea, we sauntered along the sea front in search of the Municipal Art Gallery. This we found near Finikoudes opposite the wooden pier, A group of old warehouses built in the time of British rule have been turned into a very contemporary space and serving as Larnaca’s cultural centre. There is a very interesting ceramics exhibition showing until the end of July with 22 Cypriot ceramicist’s work on display which intrigued and delighted us in turn. We also had the extra entertainment of the attendant as he kept popping in and out with remarks and comments on the exhibits. 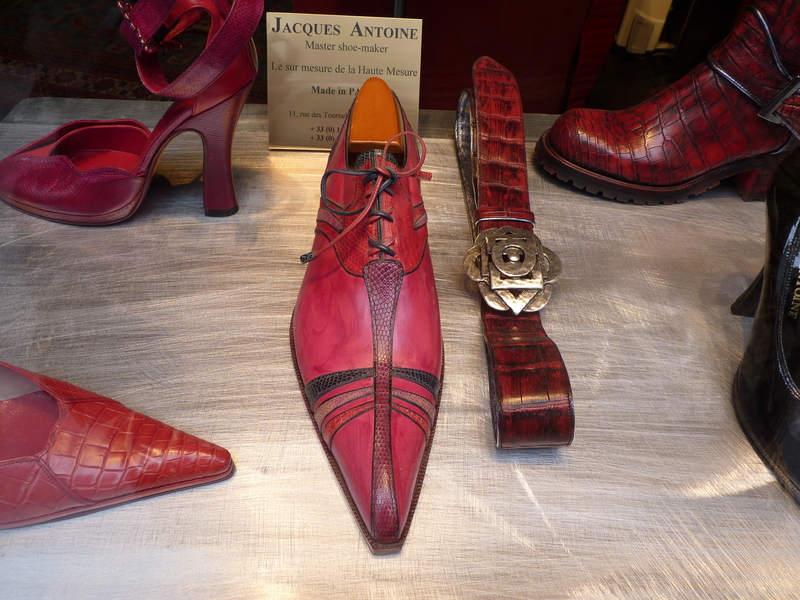 He was clearly delighted with them and finds inspiring the artist’s excursions into fantasy . These cultural gems which I am often delighted by are not very well advertised or shouted about enough in my opinion. George Georghiadhes of Lemba pottery told me that he was exhibiting here and that is how I knew of it.The gallery is not well signposted and there were no posters nearby that I saw telling you of this exhibition. It must cost money to put on so why not spend a little more for a few posters or a little effort to put a list of events online? I couldn’t find any exhibitions listed on any site mentioning the gallery only where it was why is this? In a conversation with a friend who lives in the Paphos area he remarked that a leaflet is regularly produced with the list of events for the month but that half the month is gone before the list gets circulated. Clearly there is a detrimental time lapse which means that those who want to know and possibly attend events are getting missed. There are few enough cultural events in the area so those that take place should be better organised with their networking which in turn will make them more profitable.On looking through the photos I took it appears I didn’t take many of the exhibits which is a shame as they were varied and unusual it seems I was enjoying myself so much I forgot. This week I managed to get to see some live music at last as I have been missing seeing any live performances since I’ve been here. In Paphos at the Technopolis 20 culture centre they have a full programme of events for June with some classical recitals as well as Jazz, the performance I went to see on Thursday evening however was rembetika the Greek blues. A group of musicians playing bass, bouzouki, guitar and fiddle entertained us for more than two hours in the garden under the stars, with a collection of nostalgic music. Many of the songs were well known to the audience who sang along and on occasions got up to dance. Some songs have a very compelling rhythm and you can’t help but want to get up and strut your stuff, I did manage to resist however as the fear of making a fool of myself was stronger than the compelling music. In true Greek style drinks and nibbles were available and the audience were seated at tables café style, often chatting throughout the performance some more loudly than others! Unlike Sunday when I attended a Charity Garden Party arranged by Janet Robinson of Nitbats in her very own garden around the pool which had live music throughout the afternoon. Performed by a mixture of singers in different styles from rock to blues to pop this time I couldn’t resist, this was another kind of nostalgia as I was transported back to the seventies with the same footwork to match!! Janet was raising funds for a local Hospice for cancer patients as well as a cancer charity and did a terrific job organising a very entertaining event, as well as the music there was a fashion show, a raffle and several stalls selling this and that including me of course tucked away under the arch near the loos with my books. Elena of Orexi brought along some of her delicious food for sale which went in a flash and there was of course a bar. A very jolly time was had by all and so far she has managed to raise a goodly sum of 1300 euros. I took advantage of my time over Paphos way as I stayed overnight with a friend and went to visit the church and Folk museum at Yerroskipou on Friday. I have just finished reading a book called ‘A Walk with Aphrodite’ written by Peter Breakwell describing a mammoth walk around the thirty seven villages of Paphos over very rough terrain, with the aim of raising money to buy a vital piece of equipment for the hospital in Paphos. He undertook this walk in the 1990’s and there have been many changes since that time but he records the churches he visited and historical landmarks nearby which made it a very interesting read as well as his encounters with the various Muktars and generous offers of a bed for the night. One of the churches he visited was the old church Ayia Paraskevi in Yerroskipou centre which has five domes. I didn’t remember ever having been inside although I probably have but took the opportunity to have another peep. Inside there are a few remains of some of the painted frescoes that once covered all the walls, evidence that they had been either plastered or painted over at some stage as there were signs of heavy chisel marks where the covering plaster had been removed. No photographs were allowed unfortunately and there was rather grumpy looking priest on guard so I couldn’t even sneak one in. I had long wanted to visit the museum and was not disappointed. A very large house and a nice example of its kind. It was evident from the abundance of rooms and layout as well as architectural refinements that this was the house of a wealthy man. The British consul lived here from 1800 to 1864. 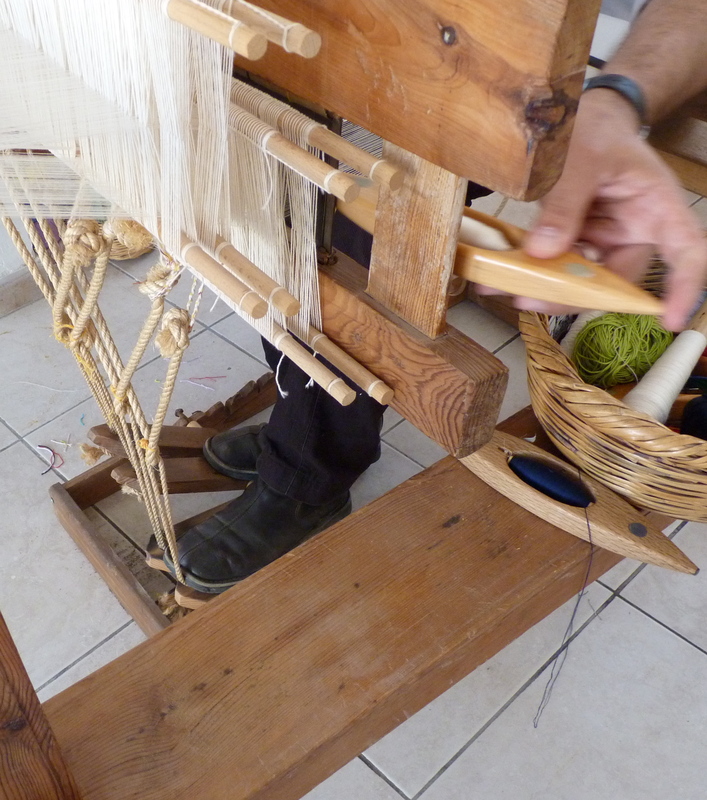 The best part was a room where there were some very fine textile examples including a very lovely piece of Fythkiotika and a beautifully unusual runner which looked like chenille work, with vibrant colours. To top it all off I was invited to watch a short video on how olive oil was made using the huge hand press that was in an outbuilding.Very interesting and as I spoke to the attendant in Greek when I first entered and established after enquiry that my Dad was from Cyprus I didn’t have to pay, bonus. Saturday morning saw me take part in yet another different past time, helping a volunteer group ACT to pick up rubbish on the beaches of the Akamas. 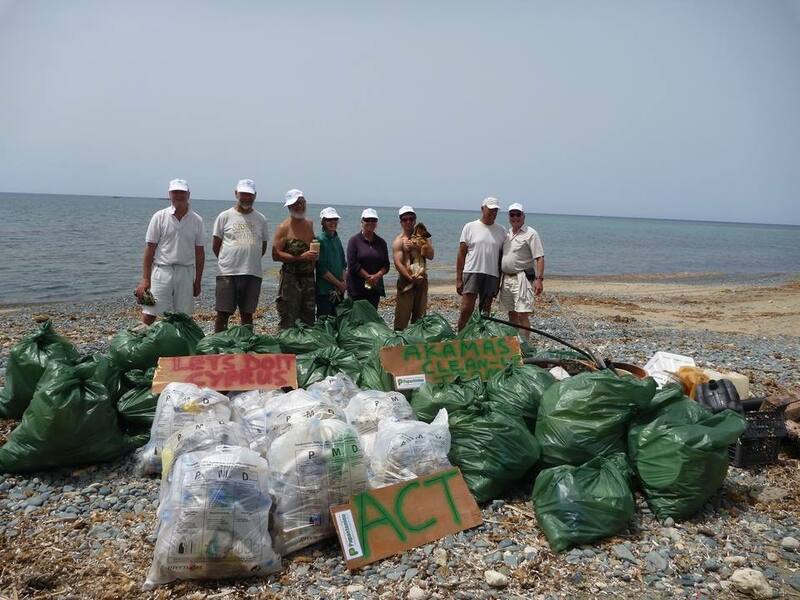 Keith Watkins along with his wife Wendy, have so far organised 16 clean up excursions to the beaches of the Akamas over a few years, they occur every couple of months. The members number around 60 altogether. My friends took me in their truck, the roads being mostly unmade and often badly rutted so the journey itself is quite an adventure. Sitting in the back was reminiscent of a roller coaster ride, the scenery though is splendid with views of a rugged coastline. 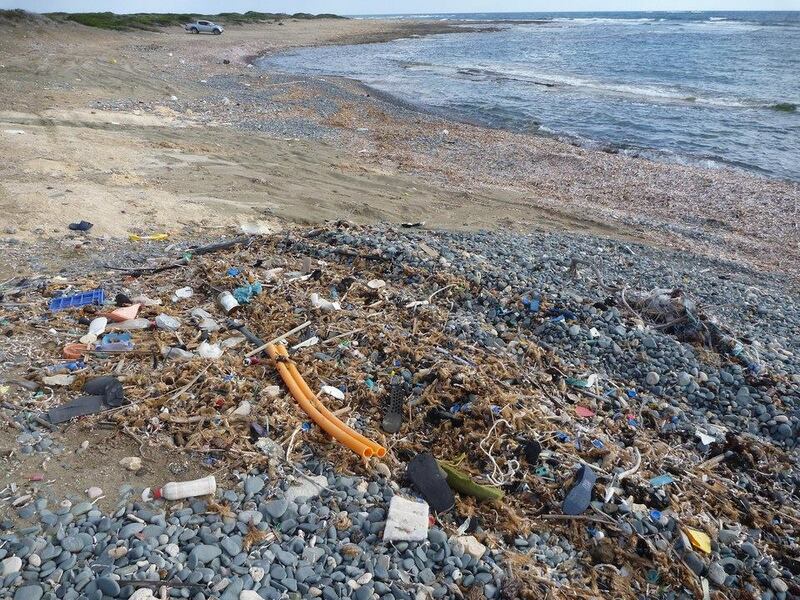 It is along this coast on one particular beach at Lara bay where the turtles come to lay their eggs every year and although it is supposed to be protected you still get ignorant people setting up their umbrellas and picnicking on these sensitive spots. Keith organises these excursions with military precision, doing a recky beforehand taking many photos of the rubbish strewn about either by careless visitors or washed up from the sea. He divides the area into sections so that they work along the coast leaving each beach pristine…. until the next time. I was astounded at the amount of rubbish, between us, there were about 10 or 12 of us, we collected 65 large garden refuse bags as well as a large haul of larger items of plastic pipe, wire and large containers and cans. These are all deposited in one spot and the Forestry commission informed, always enormously grateful who then come along and dispose of it. I could have filled one sack alone with shoes of all kinds, flip-flops, sandals trainers all sizes, I even found a back pack half buried in the sand. The coast line has a lot of low-lying bushes and debris gets tangled in the branches and caught underneath, the road to the beach was particularly bad with bottles of glass as well as plastic. On the shore there were large piles where the rubbish washed in from the sea had all tangled together with seaweed, in these there were hundreds of bottle tops and disposable lighters, in one of the gullies I found a whole carton of cigarettes saturated with sea water, apparently this is a common sight, it is suspected it could be contraband discarded before the coastguard catches them. 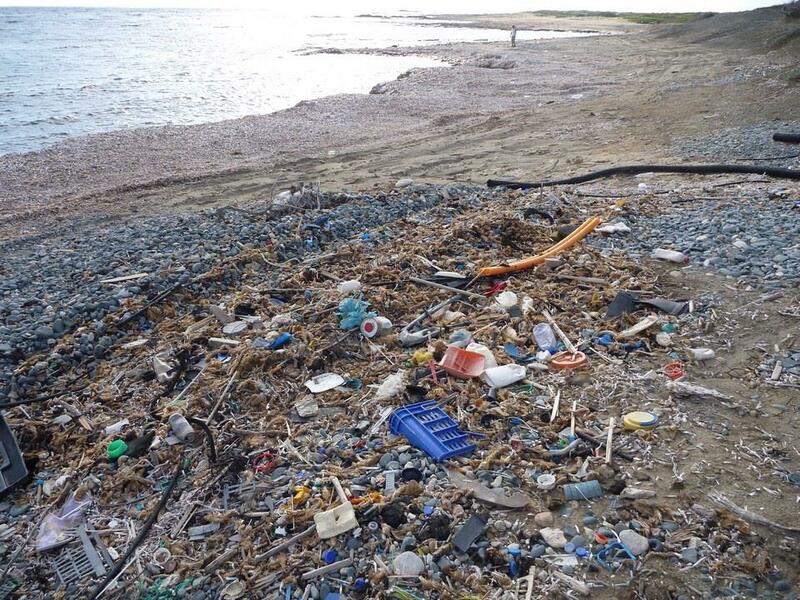 Keith should be given a medal for his initiative and effort as he is at least saving some of this plastic from degrading even further and getting eaten by the fish as well as keeping the coastline clean. I would nominate him myself if there was such an award available in Cyprus. After a few hours we all sit down and enjoy a snack often provided by Wendy washed down with a beer supplied by Keith although each person brought their own, except me. It was a great way of seeing a part of the coast I otherwise don’t have access to and doing something worthwhile in the process. I hope I will have the opportunity to participate again on another trip. There has been a bit of a lull in my blog posts as last week I had an unfortunate accident that has left me in a state of musing and shaken but nothing is broken except the car. Being without a car temporarily is rather relaxing and I have discovered the joys of getting around on foot and by bus. There is a bus stop very close which has a small minibus that runs between Polis, the nearest town about 5 minutes away, and Latchi which is further down the road. It runs every hour so very like my home village in the UK. It is possible to get around the island between the main towns by bus now, as the government in an attempt to get the Cypriots from behind the wheels of their beloved cars, set up a public transport network much needed on the island, there are no railways. It is mostly used by foreigners ‘though as even in Nicosia my relatives prefer to use their cars, most Cypriots find it strange if you want to walk anywhere rather than going by car. The buses are also very cheap compared to my local buses in the UK as to go from Polis to Paphos a 40 minute journey it cost 5 euros. I have local shops close by where I can get most things and one is even in reasonable walking distance. In thirty minutes I can also walk to a very nice beach with facilities of a cafe and showers on a lovely quiet road through the fields with plenty of interesting things to look at on the way. In fact it is one of the nicest beaches in the area as it is sandy. Of course as everyone else has a car I have had plenty of kind offers of lifts and assistance in shopping etc but I am by nature an independent person I always like to find out what I can do for myself. I took the bus into Polis on Saturday and walked to the supermarket and while walking around town. I passed the museum a rather pleasant looking building which I had never visited and always wanted too so this was my opportunity. Needless to say there was no one else there, it was small but well presented and there were some interesting pottery pieces. There was no restriction on photographs so I snapped away happily. The best exhibit for me was a massive pottery figure that was found close by to Polis. It had been made in sections the torso parts being thrown on a potter’s wheel which then slotted together. It had a very contemporary look to me the way it had been exhibited like some modern installation piece. I find that these ancient pieces can be very inspirational especially the pottery designs and decoration. I read a very interesting article recently by a fellow blogger on WordPress Anna Reeve who is a student of classics, a resident in Leeds who is very interested in ancient Cypriot pottery. She had just received a copy of an article published by the National Museum of Denmark which she had been wanting to read for some time which compares some of the ceramic work of artists such as Picasso with ancient Cypriot pottery pieces. It turns out Picasso worked with a fellow artist for a period Suzanne Ramíé and she derived a great deal of inspiration from Ancient Cypriot ceramics , some of her pieces echo the shapes of specific pieces exactly. Here is the article well worth a read. 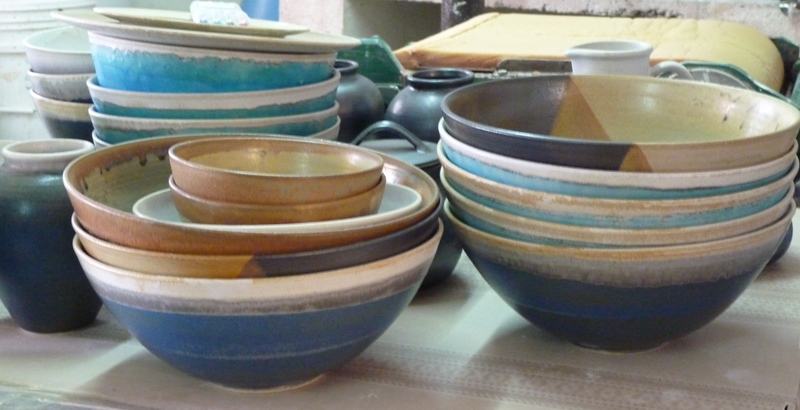 My cousin Androula introduced me to Lemba Pottery. She has acquired quite a few fine pieces over the years from the gifted master potter George Georghiades who owns the pottery with his wife Sotiroula. George’s father was a potter in the famous Lapithos region, the traditional home of pottery on the island before the Turkish invasion. George has studied both traditional and modern techniques and the shapes he utilises in his pottery reflect archaic forms of simple elegance. They have an ease and flow of line that I personally find very pleasing to the eye. 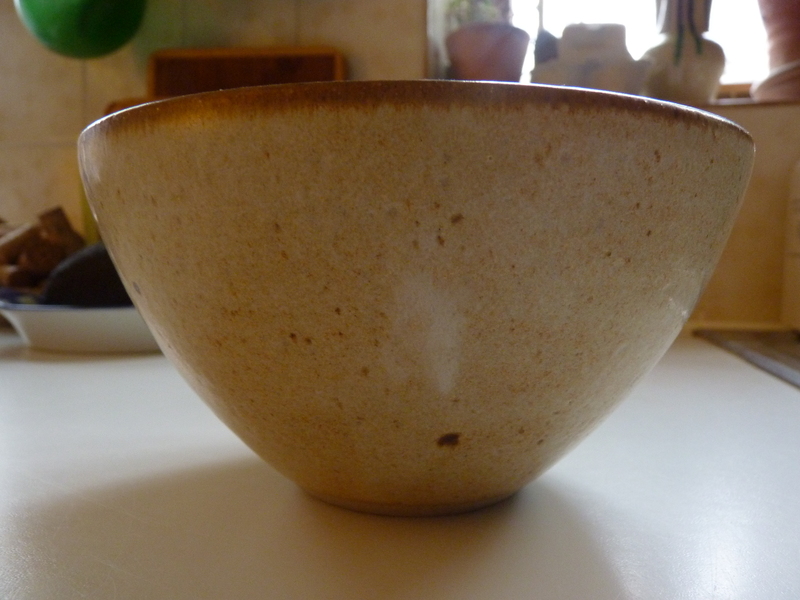 On my last visit to Cyprus I wanted to purchase some of his beautiful small bowls which I had seen on my first visit, a perfect size to use for soup. I found the colours very appealing as George uses colours that reflect the sea and the sky, so very appropriate for someone who lives a stones throw from one of the most beautiful stretches of coast in Cyprus. Whenever I use this bowl I take great pleasure in the grace of its lines, this adds another dimension to the enjoyment of my meal. 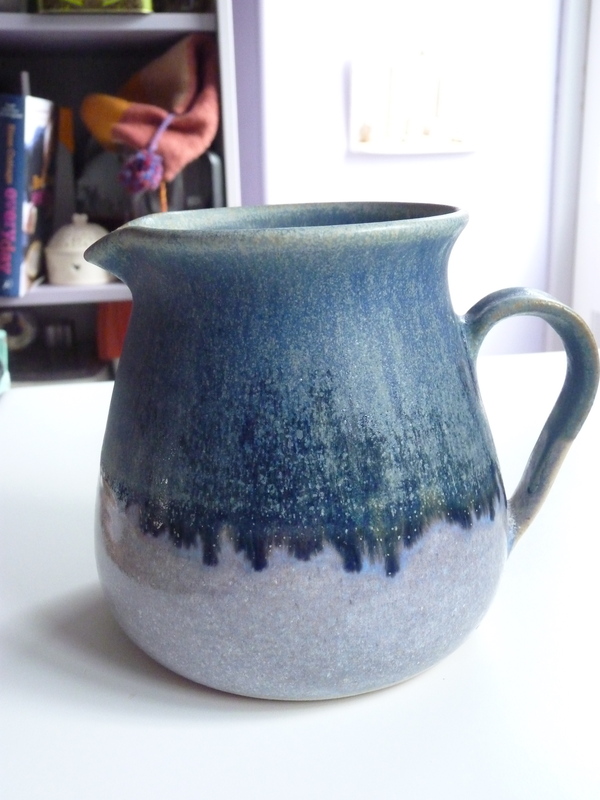 Many years ago I used to attend a pottery evening class and one of the things that fascinated me was the glazes. Most glazes use metallic oxides and these can be a real adventure to the inexperienced as the results after firing can range widely but that was the fun of it. George uses glazes to great effect producing a richness of colour that adds yet another element to entice the senses. 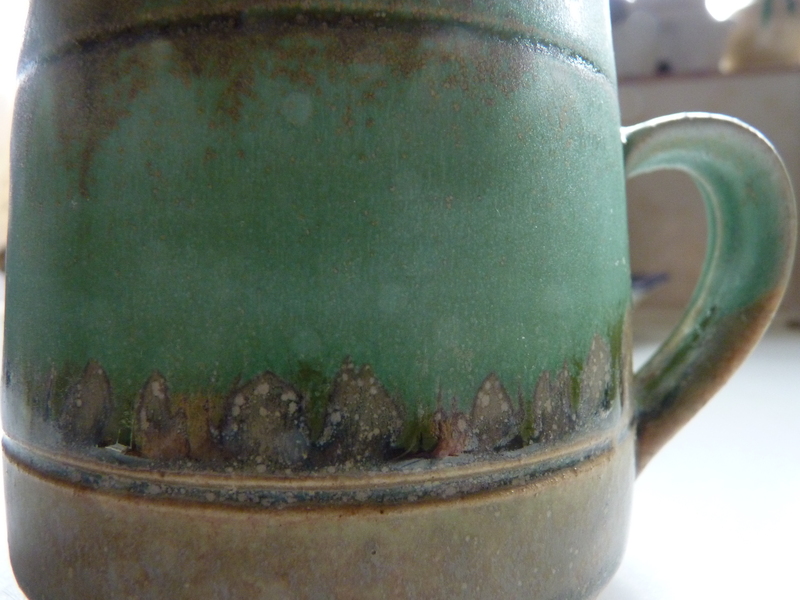 I love the mug I bought on my last trip as this demonstrates the metallic tones that can result, this one a verdigris colour. 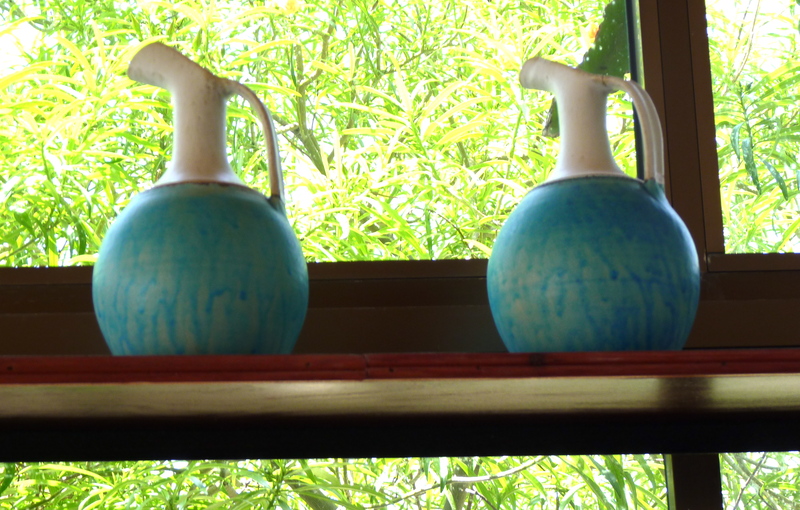 He also produces some very lovely jugs, these ones a reflection of a shape used in antiquity. The one I had to buy though has a much more utilitarian shape but one I love for its pleasing rotundity. Every detail you can see reflects the attention to detail that each piece is given lifted by the creative use of the glaze. Traditional potters in Cyprus would use the local earthenware clay which chips very easily, George uses a stoneware clay from Europe which results in a much more durable article. Traditionally potters would use a low kick wheel, where you sit low on the ground and use your knees or feet to turn it. George uses a modern electric wheel and a huge gas kiln to fire his pots. If you are in or near Lemba or plan to visit in future please pay George a visit, he is just around the corner from the fantastic Lemba Art College, more of which next time. Meanwhile enjoy the virtual tour of some of his wonderful pots here. This blogsite is all about my journey from writing ‘Androula’s Kitchen’ my first effort, to getting published. It is a journey so many have done before me and so many are doing as I write. The easy part is writing and putting together the whole package of presentation, a really fun part, but then the path ahead becomes a little hazy and confusing. There are so many hopeful writers out there and so many paths to choose from once you have written. Do you get an agent or dive straight in and find a publisher? I started looking for a publisher in Cyprus for two reasons really, one, I thought they would be more sympathetic to the material of the book and two I thought this might be simpler as there is much less choice. Indeed as far as I am aware there is only one publishing house functioning in the manner that we would expect in the U.K. the norm is more on a self publishing basis. It is a very small country the market is much smaller and so therefore are the profits I guess. I was hopeful, as very early on the one publisher showed a keen interest in ‘Androula’s Kitchen’ and I couldn’t believe my luck, they were negotiating a book distribution deal in the UK at the time of me approaching them, a vital part of the deal for both of us. Sadly a few months further down the line this deal fell through and they were unable to secure another. So this left me with the rather more difficult task of wading in and finding an agent in the U.K. Or should that be a publisher??? For better or worse I’ve started with a search for an agent purely because there are fewer of them to choose from. The list of publishers and their requirements is a daunting one which I might yet have to work my way through. At the moment I have taken advice from a writer’s web site and started with a list of 10 agents to whom, a few at a time, I’m sending an enquiry with link. It will be a slow process as they all get many submissions a week and have a respond time of between 6 and 8 weeks, but it’s better than doing nothing and sticking all that work in the metaphorical drawer and forgetting about it so I can move on to the next project. I’ll just have to grit my teeth and get on with it however long it takes. It is a task though, I have to admit ,I find every excuse to avoid, and time seems to march on inexorably. As I look out of the window the daffodils are nodding and the sun is out beckoning but my head must be forced to bend over the keyboard and plough on. Ahh publisher, publisher, wherefore art thou…..? I enjoyed making the book Androula’s Kitchen so much that I have got the bug. So when I went to Paris Last week for a few days break I made sure I took a lot of photos so that I could make a short photo book with them. There is something very satisfying about editing and choosing photos and placing them in a book. Paris is a city that presents the amateur photographer ample opportunity to take photographs that can’t help but look artistic. Every turn and every corner you are given buildings, people and views that just speak of chic, street chic. I saw so many snappily dressed young men, not in scruffy jeans hanging round there nether regions looking as if given the least opportunity they will fall around their ankles and are only hanging on by sheer strength of will.No these young men wore stylish casual trousers and snazzy shoes with non matching but well cut jackets in interesting looking fabrics, finished off with jaunty scarves. How refreshing. I feel sometimes walking around London that it is inhabited by people with absolutely no interest in clothes. It’s not even about fashion it’s about an interest in colour and texture and variety. So much drabness becomes depressing in large numbers.